SearchInform helps your company fulfil its risk management program, facilitate regulatory compliance and investigation processes, prevent corporate fraud, and detect employee abnormal behavior. All the tools and features you need to keep your company protected and solve the most complex monitoring issues. SearchInform Risk Monitor addresses a wide range of problems that occur within a company. 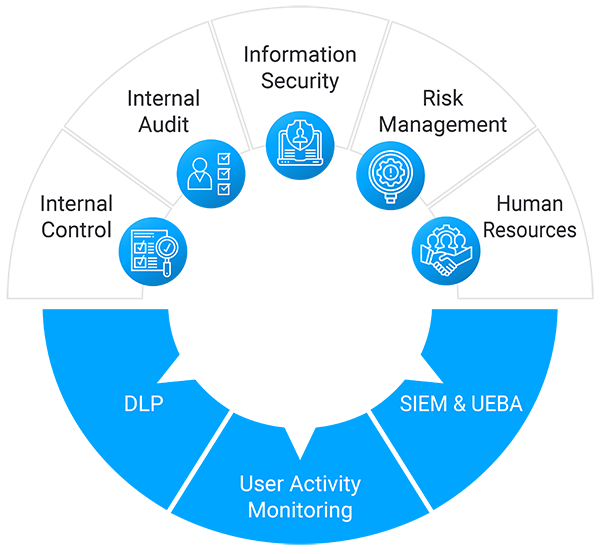 The solution helps Risk Managers, Internal Auditors and C-level executives, as well as Information Security Analysts and Compliance Officers in their day-to-day job. The preconfigured policies are ready to work with just as soon as the system is installed. The policies are tailored to various industries, including Energy, Manufacturing, Retail, Insurance, Hospitality, Government, Financial Services, etc. The software includes specific solutions suitable for any business scope and equips different organizations with an optimal framework. Statistical reports offer you a structured layout and correct details for any requested area of activity monitoring. Investigation reports, such as a relational graph and content routing report, visualize all the connections established via internal and external communication channels, thereby revealing the sources of distributed information.